This is my second pair of this lamps. 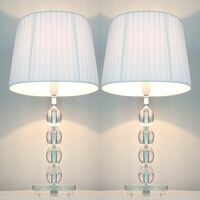 Bought the white pair two months ago Nice lamps good price and good delivery time. Friends or so love them. Very good buy. Thank you My Deal for my latest purchase. I bought these lamps for my bedroom & they go perfectly with my decor & look very stylish. Absolutely love them. Always a pleasure to purchase items from My Deal. Thank you. Great service ,prompt delivery ,could not be more pleased with purchase.Will be back for further purchases.